This post is sponsored by PackageFromSanta.com. All opinions are my own. "SANTA! I know him!" In our house, we are believers in Santa. Believing in the magic of all things Santa Claus is a wonderful memory from my childhood that I cherish and am so excited that I now get to share with my children. The key in our digital age is to encourage the belief in fun and unique ways. We participate in Elf on the Shelf each year. And we decided this year to do something extra special for the first day with a package from Santa. 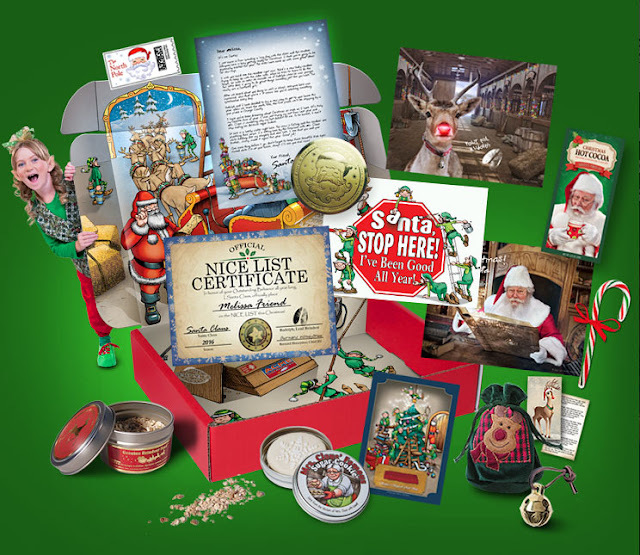 PackageFromSanta.com offers you a choice of 3 unique treasure chests of authentic, Santa Claus goodies and letters from Santa sent right to your child, directly from the North Pole! It’s a bundle of proof uniquely personalized with your child's name. It comes addressed to them so if you don't have an elf, no worries! Kids love getting mail! Every Package is painstakingly crafted, packed and shipped with care and even includes a real Santa return address and genuine North Pole Stamp. But that’s not all! Santa will also send your child a personalized phone call & a personalized, movie quality video starring your child. And they are FREE with every package. My daughter was so excited with her goodies from Santa. So was my little man who is just starting to understand. We reviewed the Platinum Package, but there are other options to choose from. And if you share pictures/video with PackageFromSanta.com you can enter to win a $1,000 Visa Gift Card. Exclusive Limited Time FREE Bonus! Keep your child behaving with a personalized, high-quality, and completely FREE printable Nice-List Guide from Santa Claus. Includes your child’s photo, name, and top 10 behaviors needed to stay on Santa’s Nice List. Personalize your child’s Nice-List Guide here www.freenicelistguide.com. How do you help your children believe in the magic of Santa? This post is sponsored by PackageFromSanta.com. I received complimentary products and compensation to provide this post. All opinions are my own. My kids are all grown, but we do have grandkids. I'll inform my kids about this. I have a confession to make. I tried not get involved in talking to the kids about Santa or the Easter Bunny, because I felt like I was deceiving them and taking away from the true meanings of the holidays. My husband was the one that got into that part of it. But he didn't make a big production out of it. My kids let their kids believe in them though and that's their choice. I think you can still believe in Santa and teach your children about the reason for the Christmas season. There has to be a healthy balance. My daughter said she wanted to ask Santa for a Christmas tree for her little brother. I thought that was a beautiful gesture and feel like I'm doing something right as a parent. My nieces and nephews would love to get one of these Santa packages. The personalized nice list certificate is such a cute touch. Love this!! thankfully we have a local Santa that is free to visit and we can write to him and HE WRITES BACK!! I love that about my community!! We work together to keep the magic alive for the kiddos!!! I watched both the videos this time and I did forget how excited little kids got over hearing from Santa, even Rudolph! I was giggling when Santa was telling Michael, he still had time to do better. And the way Michael got excited over the poop 💩 was hilarious!! I liked how Santa remembered your daughter’s birthday too! Very cute! She is so dainty, prim, & loves her little brother! These kind of feelings & emotions are what the holidays are all about!! I love this idea. I can't wait until my daughter is old enough to know who Santa is. She knows something is up this year with us reading Christmas stories. Maybe next year! Wow, this has a lot more in it than i was originally thinking. What a wonderful idea to get for the young ones. Thanks! My youngest nephew came in here yesterday and was excited to tell me that the elf was back, lol. He was thrilled. My grandsons have been so excited that our elf is back this year! It's so fun to watch them find him every morning!